The president of Russia, Vladimir Putin, and the president of the United States, Donald Trump, talked on the phone on Tuesday, marking the first instance the two leaders were speaking since the U.S. military fired missiles into a Syrian airbase. In the telephone call, the Syrian civil war was discussed besides the North Korean situation. According to officials at the Kremlin, the two leaders will allow their top diplomats, the U.S. Secretary of State and the Russian Foreign Minister, to continue discussions on a cease-fire strategy for the conflict in Syria that has been going on for six years now. “President Trump and President Putin agreed that the suffering in Syria has gone on for far too long and that all parties must do all they can to end the violence,” a statement from the White House said. In an initiative that is being led by Russia, talks in a cease-fire will start in Astana, Kazakhstan on Wednesday. Among the countries that are expected to participate include Turkey and Iran. The United States will also send a representative. In the proposal by Russia that is expected to be tabled in Astana, forces drawn from countries such as Iran, Turkey and Russia will be used to patrol the lines that will be dividing the forces loyal to the Syrian government and opposition or rebel forces. The patrolling forces will be put up in some Damascus suburbs, Homs, and in Idlib Province. A condition would, however, be imposed on the rebels as they would have to isolate jihadist groups such as those belong to the Nusra Front and ISIS. This is not the first time that such talks are being held. The Obama administration jointly with Russia organized a similar effort though no breakthrough was achieved. Regarding North Korea, the Kremlin disclosed that Putin urged restraint and called for a reduction in the level of tensions. The two leaders also explored the possibility of holding a meeting during the G20 summit that will be held in Hamburg, Germany in July. Besides having a telephone conversation with Trump, Putin on Tuesday also met with German Chancellor, Angela Merkel in the resort city of Sochi. After the meeting, Putin denied that the Russian government has been meddling with elections in the West with the latest allegations having arisen in France. 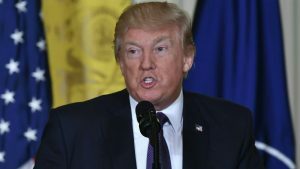 The current U.S. government administration has also had to constantly refute claims that there was a conspiracy between the Trump campaign and Russia during the 2016 U.S. presidential election campaign period.